Drawn for publication in Harper’s Weekly , “The Emancipation of the Negroes” pictures Columbia (the female representation of America) presiding over a scene imagining the difference that Lincoln’s Emancipation Proclamation would have on slavery and former slaves in the South. 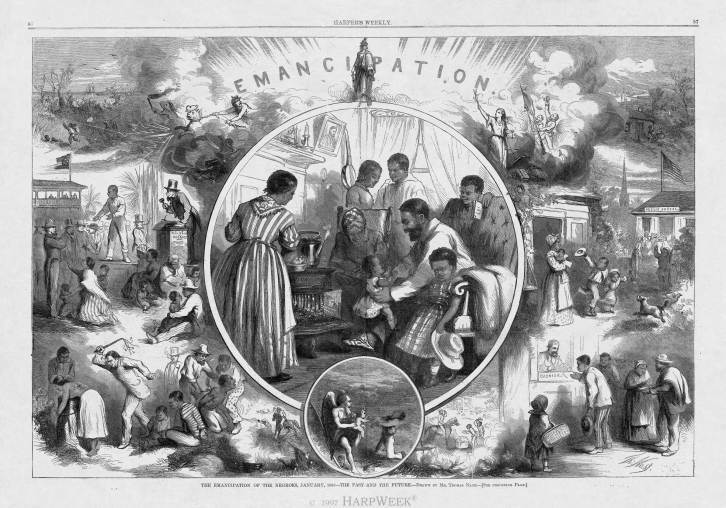 The original 1863 illustration features an abstract image of heavenly intervention breaking a slave’s chains, whereas the 1865 lithograph (see “Emancipation” by Thomas Nast, 1865) includes a portrait of Lincoln within the small circled inset. The inclusion of Lincoln’s visage highlights his ascension from sometimes-maligned president into a national martyr and revered Great Emancipator, and also begs the question of who (in the public imagination) freed the slaves.